I wrote this in 2008. I still believe every word of it. Voting is important. It is our obligation. It is our privilege. It is what makes us American. I voted early yesterday. I stood in line for forty-five minutes with a few hundred other people and cast my ballot for the 2008 election. It wasn't very hard. I didn't have to take too much time out of my day. A little planning, one skipped class and it was done. For others in line it seemed considerably harder. The lady in front of me was about my age and had two children with her. One child, a blond haired, wide-eyed 5-year-old ball of energy insisted on saying hello to everyone in line. The other was a teething baby in a carrier. The gentlemen behind me in line had to be at least 85. On his arm was a young lady who I eventually found out was his granddaughter. After cordial greetings we returned to our waiting. I silently admired their tenacity to come and stand in line to do what many people these days regard as an act in futility, especially in Utah. For those of you who read my blog that don't live in Utah, we are that state that is highlighted red on pundits maps the second the polls close. Utah always goes Republican. We are a Republican stronghold. And that is OK. The problem is, being in such a Republican state discourages people from voting. It discourages everyone. Democrats and Independents say "what's the use?" And Republicans have become complacent living in a state that last voted for a Democratic Presidential Candidate in 1964. So I just wanted to take a few minutes and explain why, even living in Utah, I feel it is incredibly important to vote. Let me just start with a reality check, because as we approach Tuesday everything coming from both sides of the ticket ends up getting drenched in hyperbole. I know that I am not saving the country by voting for my candidate. Neither major party candidate is evil. Neither one's election will mean the end of the U.S. There is no nefarious plot by either party to undermine the constitution or send our country spiraling into oblivion. Some things may get better under one or worse under another, but I believe it is safe to say that both candidates want what is best for the country. They just disagree on what is best. It is so easy to get wrapped up in the fear of "the other" that our motivation for voting doesn't come from our belief in one candidate, but from our fear of their opponent. All of the blog posts I have read for the last two weeks have been about how evil or wrong "the other" candidate is. Let me tell you what I know. I know that if my candidate loses, America will go on. I'll get to that later though. Let's get to the reasons I vote. 1. 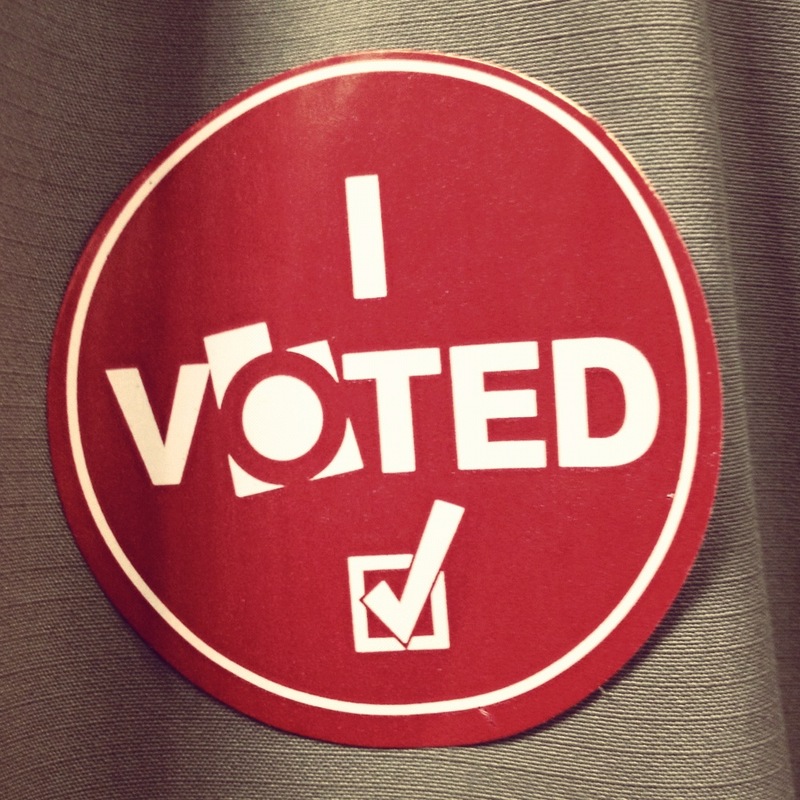 Local Elections, Constitutional Amendments, and State Referendums. My vote for President may be a grain of sand on the beach, but my local votes can be rocks in a bucket. Whether I am voting for or against Zoo funding, the Governor, School Board appointments, Vouchers, the Definition of Marriage, or any other variety of ballot initiatives - my local elections are the ones that have the most significant impact on my daily life. The state level is where the decisions are made on how to fund public education. The state level is where laws are made and created regarding who and when you can marry. We even get to elect whether or not to keep our judges! Many of these elections are won or lost by a few hundred votes, and I have the opportunity to voice my opinion. In these elections my vote could possibly be the deciding vote. That's exciting to me. That is the opportunity to make real and immediate change. How often do we get that chance? Voting makes me curious. I go online. I research different candidates and issues. I learn about both sides of arguments. I make educated decisions about my positions. I listen to other people's reasoning. I don't turn the radio station because I hear something I disagree with. In preparing for an election I become a more rounded person in the world by studying the world. Elections bring important issues out into the light of day. Even if we're not voting on something in particular everything becomes fair debate around election time. Before this year I didn't know anything about labor issues in Ohio. In 2004 I had no idea why Palestine and Israel didn't get along. Until about a month ago I didn't really have a clue what a Socialist was. I researched these things, and although I am no were near an expert on any one of these topics, I have thought about them. Just thinking about things is important sometimes, and elections make us think. On a side note, after reading about Socialism I can definitively tell you that Barack Obama is not a Socialist, but that is a completely separate blog. I feel like voting is my responsibility. I've often times heard the saying "If you don't vote, you don't have the right to complain." While that sounds witty, and at times I'm sure people wish it were true, the fact is that we all the right to complain whether we vote or not. Voting is not a requirement, but it is a responsibility. It's an obligation. It's part of a bigger picture. Sure, everyone has the right to not vote. That is a great thing, and it's important. Still, Voting in any election is not just about supporting the candidates or amendments or referendums in that specific election, it is about supporting the idea as a whole. It is about believing that the will of the people is a driving and important factor in the success of our country. And it is about supporting a peaceful and consistent transition of power. Both major party candidates have spoken at times during this election about setting an example for the rest of the world. We don't always achieve this, and often some of the things we do as a country are out of any one citizen's control. Yet one major thing we have done right every four to eight years since the civil war is facilitate a peaceful transition of power. I don't think most people realize what an amazing accomplishment that is. We check ourselves. We give people power. We take it away. We limit authority. We cycle public servants because we know that absolute power corrupts absolutely. That is why I know that we'll be fine after this election, because we are the deciders, and 232 years ago we decided that a consistent influx of new ideas was necessary to sustain a growing experiment in democracy. I absolutely believe in this. I absolutely believe in the idea that voting for any candidate, any side of any issue is supremely important. Because when I vote I know that I am not just voting for a candidate or a zoo or a judge, but I am also voting for the future. So maybe I'm not saving the country by voting for my selected candidate, but I am saving the country just by voting, and so are you. Take that for hyperbole. I am the minority in another Republican stronghold (Texas) and often feel discouraged but wholly agree with all your reasons why it's still important to voice our beliefs through our votes. Well said Dad! I'm a democrat in Utah and I must say: Absolutely. Beautifully stated. I remember reading your other blog. It was great. I shared this article and LOVE it. As a young voter, it is more important now than ever to voice my opinion and cast my vote. I encourage everyone to vote in this year's election and ALL elections. Thanks for a great read. It is our opportunity and responsibility to make a difference in our communities, lives, and our children’s future. Our representatives play a vital role in determining the level of support for health care, college funding and small business financing, among other areas. It is their job to advocate on behalf of their constituency – including you. I'm a Tea Party Conservative in California. But I vote. Because my voice matters. Even in this state. Thank you for your article. I'm going to show it to my son. Especially when we speak about computer science, business, and modern nursing technology, it makes sense to keep on studying new approaches to solving problems, look at to find more information!